Not many differences in this one. For me it was all about refreshing my understanding of the PSA,MPP’s,PSP’s and SATP’s and in what circumstances would I use what command. 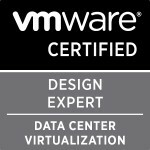 http://www.vmware.com/files/pdf/techpaper/vmware-multipathing-configuration-software-iSCSI-port-binding.pdf A VMware technical white paper showing every single step necessary. I read this one twice as this covers it perfectly and seeing as it is a new feature of vSphere 5 to have the new UI interface to support multipathing configuration for the software iSCSI adapter using port binding i think it’s a technique to know for the exam. A fairly straight forward objective once i got my head around all the components again. Categories: Certifications, VCAP | Tags: Objective 1.3, VCAP, VCAP5, VCAP5 Blueprint, VCAP5-DCA | Permalink.